Rome between the Tiber and the Aniene on the east side, against the steep slope of the Pincio, represents the terminal mostra of the aqueduct. Dea Roma armed with lance and helmet, and in front is the she-wolf feeding Romulus and Remus. Next stop Piazza Navona. I had the impression that there would be a lot of activity here, like open markets and things. But there was not, so I was a bit disappointed. and I didn’t get back there again. Either I was too early, or too late. Of course in the evening it is probably an entirely different scene. The fountain consists of a towering obelisk that was recovered, at the behest of Pope Innocent X, from the ruins of the Circus of Maxentius, along the Appian Way. 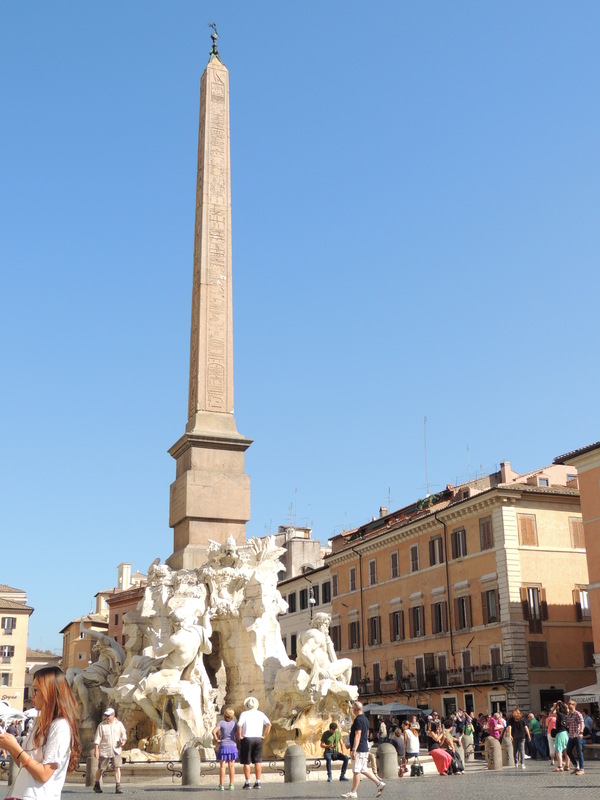 The obelisk was made in Roman times with Egyptian granite, which before being moved to the circus had been either in the Circus Agonalis or at the Iseum Campense, as the hieroglyphic inscription on it states it was made under Emperor Domitian, who had those two monuments built. On the tip of the obelisk, on what used to be its pyramidion, there is a dove bearing an olive branch in its beak. The dove was meant to symbolize the pope’s family, but also to remind the faithful of the dove that Noah saw returning to the ark with an olive branch – a sign that the fury of the flood had subsided and that nature had started to flourish again: it was time to disembark and re-populate the earth. The main fountain in the Piazza is the Fountain of the Four Rivers. As with so many monuments, fountains etc in Rome, it is quite large with the figures being bigger than life-size. The Fountain of the Four Rivers depicts Gods of the four great rivers in the four continents as then recognized by the Renaissance geographers: the Nile in Africa, the Ganges in Asia, the Danube in Europe and the Río de la Plata in America. Each location is further enhanced by animals and plants of that country. The Ganges carries a long oar, representing the river’s navigability. The Nile’s head is draped with a loose piece of cloth, meaning that no one at that time knew exactly where the Nile’s source was. The Danube touches the Papal coat of arms, since it is the largest river closest to Rome. And the Río de la Plata is sitting on a pile of coins, a symbol of the riches America might offer to Europe (the word plata means silver in Spanish). Each River God is semi-prostrate, in awe of the central tower, epitomized by the slender Egyptian obelisk (built for the Roman Serapeum in AD 81), symbolizing Papal power and surmounted by the Pamphilj symbol of the dove. The Fountain of the Four rivers is a theater in the round, whose leading actor is the movement and sound of water splashing over and cascading down a mountain of travertine marble. The masterpiece was finally unveiled to the world on June 12, 1651, to joyous celebration and the inevitable criticisms of the day. Fontana del Moro (Moor Fountain) is a fountain located at the southern end of the Piazza Navona in Rome, Italy. It represents a Moor, or African (perhaps originally meant to be Neptune), standing in a conch shell, wrestling with a dolphin, surrounded by four Tritons. It is placed in a basin of rose-colored marble. 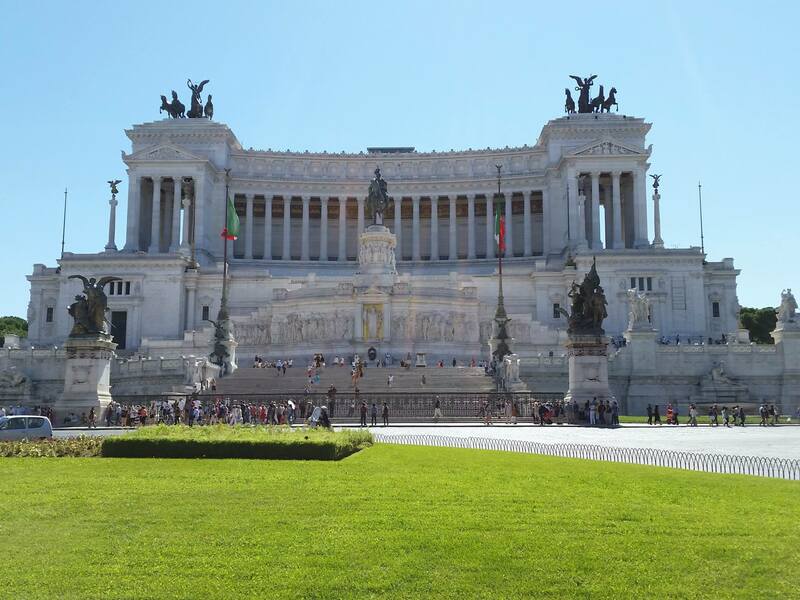 One of the places I really wanted to visit was the Victor Emmanuel monument. The main reason was the view from the top of it was supposed to be fantastic. Richard encouraged me to take the bus since I’m opposed to doing that when I travel unless I really have to. I would rather walk everywhere. I remembered that Rick Steves talked about a small electric bus that was always outside of the Piazza del Popolo on Via Del Corso and that it could be used like a Hop On Hop Off. Sure enough, the bus was sitting right there so I boarded. We did not leave however, until not another person could be squeezed onto it. We were packed in like sardines. It was at that point that I was very aware that I had my phone in my front pocket as well as my wallet. I had to use my cane that day, so I was holding onto an overhead bar for balance with one hand, and holding my cane with the other. I realized that I could easily have been pick-pocketed. Something I’d read over and over again to be aware of while in Rome. With each bump down the street, and staggering rider, I looked immediately to see where the persons hand(s) were that was standing next to me. It would be only in Rome that I was ever aware of the possibility of pick pockets and felt the need to be mindful. Anyway, because I was standing in the middle of the bus, I couldn’t see where we were on the street. I knew that it was the 5th stop that I wanted, the Piazza Venezia, but people were pulling the cord to request stops, and since I didn’t know if where the bus was stopping was a scheduled stop or not, I really wasn’t sure where to get off. I needn’t have been concerned however, as once we got to the Piazza, it was pretty obvious. Riding a bus is something I need to study because I seem to be using one more often when I travel. The whole, pulling the cord because you want to get off, idea. Can you pull it anytime? Does it have to be only if it is a “scheduled” stop? Will the bus automatically stop at a scheduled stop, or only if there is someone waiting at that stop, or if the cord was pulled? And just how do you read those signs on the street? When I do get on a bus, I know what stop I want, and how many stops it is until that stop. What I don’t know as I said above, is, if you are allowed to pull the cord anytime you want to stop, then knowing it is the 5th stop, could become the 7th stop very easily. But, this time, I arrived at the stop I wanted without any trouble and behold, Piazza Venezia and the monument. I knew that one of the reasons that Romans didn’t care for the monument was because of its size. Well, now I can see why. It is ginormous!! The Altare della Patria , “Altar of the Fatherland”, also known as the Monumento Nazionale a Vittorio Emanuele II (“National Monument to Victor Emmanuel II”) or Il Vittoriano, is a monument built in honor of Victor Emmanuel, the first king of a unified Italy. It occupies a site between the Piazza Venezia and the Capitoline Hill. The monument, the largest in Rome, was controversial since its construction destroyed a large area of the Capitoline Hill. The monument itself is often regarded as conspicuous, pompous and too large. It has been described as being “chopped with terrible brutality into the immensely complicated fabric of the hill.” The structure is not designed in a “Roman” style, but is a mingling of Greek and Teutonic styles. It is clearly visible to most of the city of Rome despite being boxy in general shape and lacking a dome or a tower. The monument is also glaringly white, built from “corpse-white marble” imported from Botticino in Brescia , making it highly conspicuous amidst the generally brownish buildings surrounding it. In 1885 construction of the monument started after a design by Giuseppe Sacconi, winner of an architectural contest. The northern slope of the Capitoline Hill was cleared to make way for the monument. Roman ruins and medieval churches were destroyed in the process. The Vittoriano features stairways, Corinthian columns, fountains, an equestrian sculpture of Victor Emmanuel and two statues of the goddess Victoria riding on quadrigas. The structure is 135 m (443 ft) wide and 70 m (230 ft) high. If the quadrigae and winged victories are included, the height reaches 81 m (266 ft). It has a total area of 17,000 square meters. Sacconi never saw his monument completed as he died before it was completed. 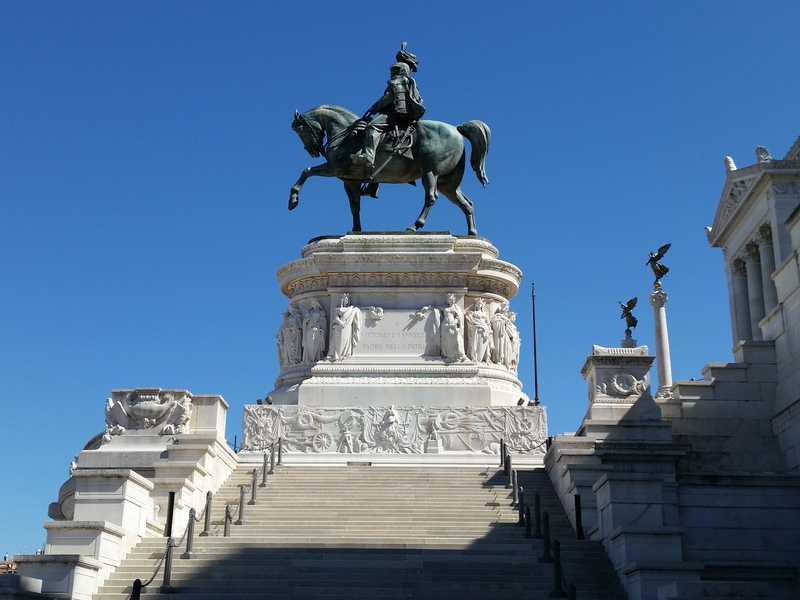 The colossal equestrian statue of Victor Emmanuel, the ‘Father of the Nation’. The statue, the work of sculptor Enrico Chiaradia, weighs fifty tons and measures twelve meters long (39ft). Tomb of the Unknown Soldier, inaugurated in 1921. 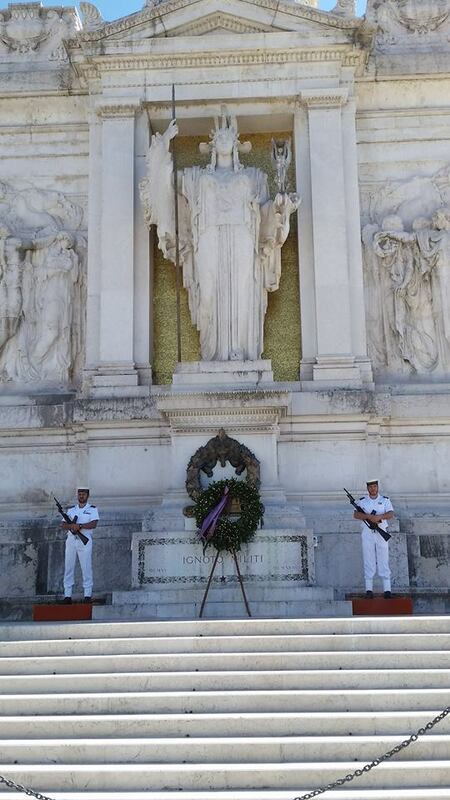 Guards of honor, alternately selected from the marine, infantry and air divisions, stand on guard here day and night. One thing that I wish more places would enforce, is that you are absolutely not allowed to sit on the stairs or anywhere else on the monument. There are benches built into the wall near the entrance and this is the only place you are allowed to sit. I never understand people that drape themselves on monuments, statues, fountains etc in any city, as if it were their living room couch. To me, this is so disrespectful and vulgar. Maybe that’s where the term ‘Vulgar Tourist’ comes from? It turns a thing of beauty into something that looks trashy. There is a guard complete with whistle! that walks around and tells people to move. Brava on this Rome! I took the Metro over to Vatican City one morning. It was nothing like subway stations here with large maps showing the different lines and stops. I asked a Metro worker where to catch the train to the Vatican and he gave me directions to the platform. I followed his directions and got on the train. Once on the train, there was the familiar sign showing the stops. As soon as the train started I realized we were going in the wrong direction. I didn’t panic I simply got off at the next stop, found my way to the correct platform on another level, and got on the correct train. Yay! I’m learning. It was literally a sea of people walking the 6 blocks to the Vatican City. Inside were the familiar lines I’d seen in videos of people lined up from outside the walls and all around Piazza San Pietro. 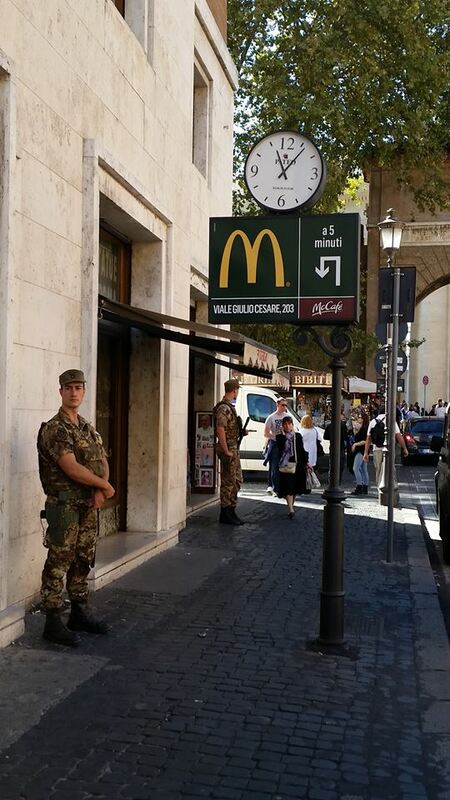 I remember our driver telling us on our way into Rome that people start lining up as early as 5:00 A.M. I didn’t purchase a Skip The Line pass for Saint Peter’s and there was no way that I was going to wait in line for hours to go inside. I took a few photos after wandering around a little bit, then stopped at a W/C before walking back to the Metro. There was a young guy in front of me who by the time he was 2 people away from being next, was literally dancing he had to go so bad. Been there buddy, feel your pain! He didn’t even bother to close the door behind him when he got in the stall. Poor guy…. It was the most disgusting bathroom I was in the entire 2 week trip. It was soaked in urine and took a lot of toilet paper and antibacterial wipes (yes I always carried them just for this purpose!) before it was usable. Ewwww……and here’s something else I discovered while in Italy and using W/C’s. There are not any toilet seats, at least not in any of them that I used, plus, they are fairly low to the ground. I understand that it used to be just holes in the ground with places for your feet, and while Italians/Europeans of all ages were obviously accustomed to this and/or used to hovering? this old lady isn’t, I have to sit. Ok, TMI sorry….. I like to think that the idea of fast food establishments in Italy are so offensive, that you can enter, but do so at your own risk! I have given up on carrying my small DSLR, tablet, water bottle various wipes for W/C’s and other things with me because my neck and shoulders are too messed up. Within a short period of time, I am in agony. No matter how I situate the bag, or distribute the weight, it just doesn’t matter. I had bought a new crossover messenger style bag just for this trip, but I am not getting much use out of it. I am using a lot of Icy Hot rub and taking mega amounts of Advil and Alleve but it isn’t doing anything. I found myself wandering in the direction of the monument once again because I wanted to see and climb the Cordonata for some reason. As long as I was headed in that direction I made my way over to the Pantheon, but skipping Trevi Fountain since it was closed. Since I don’t plan things, I just wander until I get to where I want to go. I know what direction to go and just start walking, yeah, I suppose that might be considered silly by many, but my aversion to using Public Transportation is pretty strong. I am extremely stubborn in my insistence that I can walk everywhere. I think I see using a bus as giving up my freedom and independence and well, I am just not ready to do that yet! Sometimes I get beyond the point of no return and some day I will probably regret doing this because I just might not be able to get myself back on my own steam. This particular day was pretty close to that. But it was the last day in Rome. When I set out on this last journey, I was on my 4th wind of the day. I was using my cane and having a whole lot of trouble walking. My left leg was nothing more than a dead weight, and the right wasn’t much better, but walk on I did. When I finally got to the Cordonata, I looked up the steps and questioned if I really thought I should try to walk up. But darn it anyway, I got myself this far, I wasn’t going to stop now. I made the comment on my Facebook post that I probably looked like I was on a Pilgrimage or something. It was all I could do to get up each step. I had no choice but to drag my left leg up each step, I wasn’t able to lift it at all. Using my cane in my right hand, and pulling myself up with my left using the side of the steps, I was able to eventually get to the top. It took so much out of me that I just turned around and made my way back down, being very careful that my left foot didn’t get stuck as I dragged it and send me tumbling down the stairs. What a stubborn old fool I am huh? At least I admit it. I got back to Piazza Venezia and contemplated how to get back home. I already knew what bus NOT to take from my adventure yesterday, so I started walking, such as I was, in the direction of the apartment hoping to find a bus stop going where I needed to go. I ended up walking the mile back to the apartment never finding a bus stop that would get me back. The Pantheon – over 2000 years old is a miracle of architecture. The dome is a perfect sphere because its height is equal to its diameter: 44 cm to 43 m 43 m 44 cm. The dome of the Pantheon is the largest in the world since ancient times and was the largest in western Europe until Brunelleschi’s Dome in the church of Santa Maria Maggiore in Florence was completed in 1436. Rain and light enters through the unglazed oculus above the dome: a hole of almost 9 meters in diameter. The floor has 22 virtually invisible manholes that allow the rain to filter. The oculus is the only means of light inside the Pantheon besides the front doors. The dome is constructed of stepped rings of solid concrete with less and less density as lighter aggregate (pumice) is used, diminishing in thickness to about 1.2 m (4 feet) at the edge of the oculus. The dome rests on a cylinder of masonry walls 6 m (20 feet). Hidden voids and the interior recesses hollow out this construction, so that it works less as a solid mass and more like three continuous arcades which correspond to the three tiers of relieving arches visible on the building exterior. Originally, these exterior walls were faced with colored marbles. The Pantheon has been in continuous use since it was built and is still used today. Piazza del Campidoglio, on the top of Capitoline Hill, with the façade of Palazzo Senatorio. For the life of me I cannot figure out why I had virtually no appetite the entire time I was in Italy. I will never understand it since this is certainly not something I experience very often, let alone for 2 weeks! We all had dinner one evening at an outside Ristorante where we enjoyed a conversation with the couple sitting next to us from Vancouver, Canada. The meal was wonderful, despite our being over charged for one of our appetizers. I don’t really like clams, or mussels, but I ate every single one of them they were so good! I had pizza one afternoon that was just so-so. I ordered a simple pizza of tomato, mozzarella and anchovy – but the anchovy was so over powering that it was all I could taste. Pizza seems to be one size in Italy, about 10″, so too much for me to eat. I had a wonderful salad from a small restaurant close to the apartment that I would have liked to return to had I had more of an appetite. We dined on take away as they call it in Italy on our last night out on the terrace. We got what was the last of the pizza and they closed as soon as we left. I tried Gelato from 3 different places and none of it was very good .. it seemed more like sherbet to me, it certainly wasn’t very creamy and rich like I had thought it would be. The first 4 photos here are of our dinner together at the outdoor Ristorante, I had the Spaghetti Frutti di Mare. My only other meals in Rome were the few pieces of the Pineapple boat, porchetta and cheese, and the delicious Capaccio di Polo. Yeah, I know, not much of a representation of what Rome has to offer. Hopefully once we get to Florence and Venice, my appetite will be back to normal and I can feast on fresh local fare. Carpaccio di Polo servito con verdure Croccanti e dressing al limone. Translation: thinly sliced raw octopus with crispy vegetables and a little lemon dressing. The Boys were always off on their own adventure each morning before I was, with Dennie leading the way, plan in mind and map in hand. I don’t normally have a plan when I vacation. I have places and things that I would like to do but don’t usually plan it out unless of course it is something that requires doing so. I usually look at things the night before to get a general idea of where something is if I don’t already know. A long time ago when I would travel I planned out each day, all day, and quickly realized that what can be done on paper, is much different than what can be done in real time. It also makes for a very hectic day and vacation to me should be about relaxing and enjoying your time wherever you are. I’m not saying that always being on the go is a bad thing in any way, but for me, it isn’t enjoyable. The older I get, the more difficulty I have Cognitively and physically, it has become more important that I don’t try to do too much. Sometimes this is extremely frustrating and maddening. I had 2 days in Rome that were very difficult to get going because of Cognitive problems. The more frustrated I get, the worse the problem becomes to the point where I become paralyzed with confusion. While I don’t want to always be on the go, when this kind of thing happens, I end up wasting so much time and then I get angry because I know that I am missing things that I want to do. I am slowly learning to deal with it. I didn’t much care for Rome to be perfectly honest and was ready to move on to Florence. Rome was just too much for me, too busy, too many people, too congested, too much (crazy) traffic. Yes, the motorbikes DO drive on the sidewalks. Sidewalks tend to be very narrow forcing you to walk in the street much of the time. Cars, although small, drive quite fast on all streets and it is up to you to watch out for them and move out of the way because chances are on these narrow side streets, they are not going to stop. They will of course honk their horns and yell things as they wiz by you. There does not seem to be many traffic laws. Park where you can, including the sidewalks. Pedestrians do not have the right of way, ever. A crosswalk does not mean that traffic will stop. To cross a street in Rome, you just do it, just step off the curb and into traffic. Traffic will slow down and pause, but not until they get within inches of you. As soon as you are clear they race past within inches of you. For a first time visitor, this is something you have to learn to get comfortable with. I enjoy cities such as Manhattan, San Francisco, Boston all of which are quite crowded and congested but the crosswalks do mean something. There seems to be organization to the chaos that there isn’t in Rome. I wished I had been able to get to the Trastevere, I think I would have enjoyed that area much more. Dennie said many times that Rome is hard to get around and he and Richard are very experienced at using bus and subway systems and reading maps. I think that was also a part of why I didn’t enjoy it as much. Things are pretty spread out in Rome and I rely on my walking where I want to go most of the time. Places and names being in a language that I don’t understand make it more difficult to get around if that makes sense. Remembering names like Main Street or 1st Avenue are easier than Via Del Quirinale and Gianicolense. First I have to figure out how to pronounce them, so that I can remember them when I see them. Street signs are not the norm anyway, instead, names of the streets are on the buildings, sometimes that is. Not always. I have said I have no desire to return to Rome, but maybe, after I travel to Italy more and learn more Italian, I will change my mind because it won’t be as frustrating. We’ll see. For now? On to Florence and then? VENICE!!!!!! Wonderful pictures and post Rae. I am so glad you made the most of Roma. I agree its crowded and full of traffic but that’s how big cities are. we just need to find our moments of peace and quietude in Rome too. Looking forward to read the rest of them! Me too. And yes absolutely Rae for now lets stick to Delhi and NY 😉 I hope you can visit it sooner! These photos of Rome are amazing! And your explanation of the places you visited were so precise I felt like I was right there with you! Great job on this blog! Thanks Deb.. but I cannot take credit for all the captions on places, but I can to all the narrative.